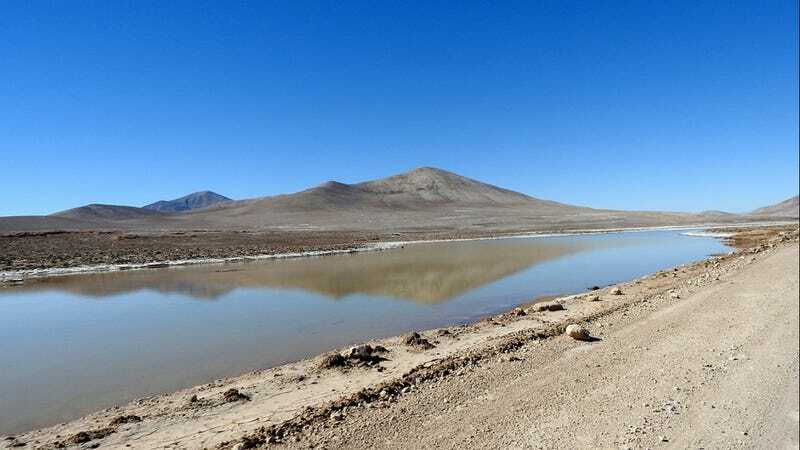 A small, temporary lagoon in the Atacama Desert caused by unprecedented rains. After not experiencing any meaningful amounts of precipitation for at least 500 years, Chile’s Atacama Desert is finally getting some rain. Quite unexpectedly, however, these rains—instead of fostering life—are doing the exact opposite. Life on Earth cannot exist without water, but for microbes highly adapted to arid conditions, the sudden introduction of excess water can be utterly devastating. Such is the conclusion of a new paper published this week in Scientific Reports. Fascinatingly, these findings, while applicable to life on Earth, may also apply to ancient Mars—a planet possibly capable of fostering microbial life during its ancient past, but at the same time susceptible to catastrophic flooding. Located in northern Chile, the 105,000-square-kilometer (40,540-square-mile) Atacama Desert is one of the oldest and driest deserts on Earth, and it’s been this way for 150 million years. This desert features a hyperarid core, with climate models predicting major rainfall events at a paltry rate of once per century. That said, no significant rainfall had been recorded in this region for the past 500 years. But things are changing in Atacama Desert—and not necessarily for the better. Since 2015, this desert has experienced three significant rainfall events—two in 2015 and one in 2017. Water from these rains collected in super-salty lagoons, which lingered for several months before dissipating. In light of these unprecedented meteorological events, a team of astrobiologists from Cornell University and Spain’s Center for Astrobiology (CAB) visited Atacama to see how the rains and these hypersaline lagoons may have affected microbial life in this exceptionally arid place. Water may be scarce in the Atacama Desert, but that doesn’t mean the area can’t support life. The soil there contains lots of salt, nitrates, and sulfates. Organic compounds, not so much. That said, a surprising amount of life is known to exist in the dry soil, organisms that represent all three domains of life (bacteria, archaea, and eukaryota) Extremophile microbes, after evolving for millions of years, managed to find a niche in this extraordinary environment. The recent rainfalls, as the new study shows, were not kind to these tiny critters. Instead of triggering a flourishing of life, the rains have caused tremendous devastation to the microbial species that have made the desert their home for millennia. “Here we show that the sudden and massive input of water in regions that have remained hyperarid for millions of years is harmful for most of the surface soil microbial species, which are exquisitely adapted to survive with meager amounts of liquid water, and quickly perish from osmotic shock when water becomes suddenly abundant,” the authors write in the study. By “osmotic shock,” the researchers are referring to a process whereby a sudden change in water concentration disrupts the normal functioning of a cell. It’s basically a fancy term for cellular drowning. Rain clouds responsible for the rare precipitation in the Atacama Desert in June 2017. The unprecedented rains, the authors say, are the result of changing climatic conditions over the Pacific Ocean. An extensive “mass of clouds” came to the desert from the Pacific Ocean—an “unprecedented phenomenon,” the researchers say, that occurred twice in three years. The resulting precipitation resulted in the widespread extinction of many native microbial species. The local extinction rate, according to the new study, reached as high as 85 percent in the hardest-hit places. Extremophile organisms, accustomed to arid conditions, were unable to cope with the influx of water. Among the microbes that survived the liquid onslaught was a newly identified bacteria called Halomonas. This investigation shows that the already low microbial biodiversity found in these extreme environments become even more diminished when water suddenly appears on the scene and in copious amounts. The researchers say these findings could hold implications to our understanding of how microbial life may have been extinguished on Mars, if it ever appeared there (something we have yet to prove). Mars is a currently a dry, dusty planet, but it wasn’t always that way. What’s more, Mars is known to have experienced catastrophic floods in its ancient past. “Mars had a first period, the Noachian—between 4.5 and 3.5 billion years ago—in which there was a lot of water on its surface,” said Fairén. Eventually, the Red Planet lost its atmosphere, and its surface water shriveled away. As this was happening, however, from around 3.5 to 3 billion years ago, large volumes of water still flowed on the surface. It’ll be interesting to see what happens in the Atacama Desert moving forward. Will our changing climate bring more rains to the desert? And if so, will these rains continue to ravage life, or spawn a new ecosystem? Only time will tell.